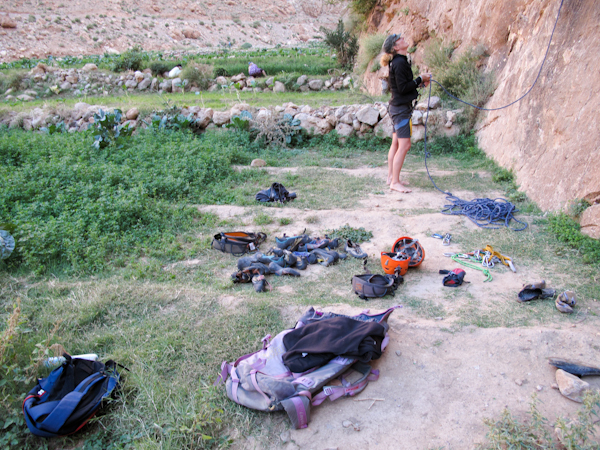 Climbing Magazine rates The Todra Gorge number one in North Africa, as does Hassan, a stocky 38-yr-old Berber who created most of the routes. “You know Lynn Hill?” he asks, “she put up an 8+, we call it Nice, Nice, because she is so very nice.” Organized tour buses loop retired tourists from Germany, Israel and Spain through the gorge. We emerge from a rusted out Mercedes Benz taxi, circa 1960s, with backpacks and dirty clothes, and immediately discern hundreds of bolts caressing the rock. Before we even know what we are looking for, Hassan has found us. For several days we join his world o f beautiful sport climbing. 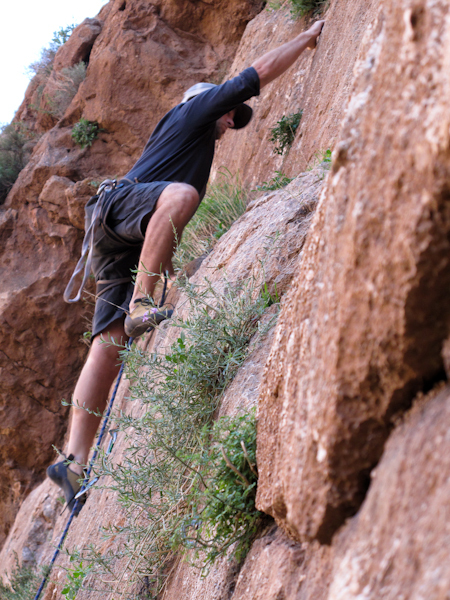 Decades of experience, he needed few draws, skipping multiple bolts, I could hardly keep up the belay. Jay would lead and I would clean. So went our days. Around Berber women working terraced gardens, we had access to awesome cliffs. Technical cracks, ridges, sharp crags and overhangs worked our unconditioned, lazy bodies. 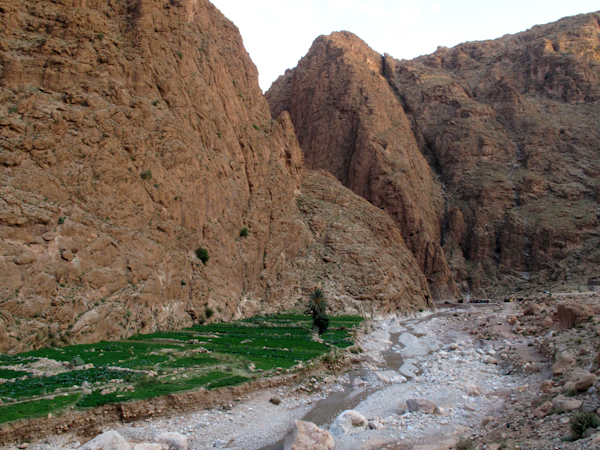 A days end, fingers sores, we would retrace our steps back to Hotel Valley and share stories over steaming Moroccan tea. Hassan taught us the formality of pouring from the silver teapot 2 or 3 feet above the first cup, then dumping its content back into the pot. Three times was tradition. Finally, the tea was poured evenly into small glasses and passed around. He has smoked his entire life, doesn’t want children, no need for a website or internet, “I know already too many people…” He has traveled, France was too expensive, Morocco is preferred.